Big Fish & Begonia (Dayu haitang) is an animated Chinese fantasy epic that, without trying to be culturally insensitive, obviously falls into the Japanese anime style of Miyazaki Hayao, though in the broader sense is also donghua, following in its own long Chinese tradition of animation. China has seized upon animation as a burgeoning segment of the entertainment industry within the country and one they feel they can grow and promote, especially given the long history of donghua within China and the love of animation throughout Asia and the world. One of the most successful products of that new artistic endeavor to date is this film. In this film that took directors/writers Liang Xuan and Zhang Chun and production companies Beijing Enlight Media and Biantian (Beijing) Media 12-years to make, the mythical and the ancient traditions of China blend in a fantastical story of love, hope, and sacrifice, delving into the mythos of Chinese traditions. Far beneath the sea an ancient race of creatures who control the tides and the seasons reside. When their youngsters come of age at 16, they are allowed to transform into red dolphins and pass into the human world to explore it as a rite of passage. One such being is the tempestuous young girl Chun who is anxious to explore the world of humans. While there, she sees a young fisher boy with whom she becomes fascinated and she begins to follow him and his little sister – but the human world is dangerous, and Chun finds herself trapped in a net. The boy swims out to save her, but he gets caught up in a maelstrom, drowning at the bottom of the sea. Upon returning to her world Chun is determined to save the boy and bring him back anyway she can – and she does find a way. She is given the power to save his soul, but now her life is entwined with his, and now she must fight against the elders of her world and her own family to protect him. Big Fish & Begonia is a beautiful, mythical journey that, like the films of Miyazaki, lives in the realm of fantasy, but is grounded by the humanity at its core. The magic and visual glitter of the film are all window dressing for what is a heartfelt coming of age story told in a methodical pace – of a young woman learning to take responsibly for her actions, learning to love and care for people, and finding her place in a complicated world. As with many animated fantasies such as this, they end with a spectacular sequence of action and Big Fish & Begonia is no exception. If the animation and character designs were to be admired, here in the final act they are downright jaw dropping and most definitely in the same league with anything coming out of Studio Ghibli. 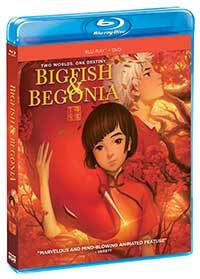 Big Fish & Begonia comes to Blu-ray in what is a beautifully rendered 2.35:1 AVC 1080p encodement from Shout! Factory. Despite some very minor flaws with color banding in some fills and small aliasing that shows up, this one looks gorgeous with excellent color and detail and the majority of the time is a clean and satisfying presentation. Big Fish & Begonia comes with its original Mandarin soundtrack in a DTS-HD Master Audio 5.1 mix and an English dub also in the same 5.1 DTS-HD Master Audio. The sound is atmospheric with a beautiful balance of the emotive score and some solid sound effects mixed into the surround channels. Low end is extended, but not raucous by any means. The biggest issue with the sound is that it is mastered fairly low and dynamics seem to be constricted a bit. The Mandarin track is the superior of the two as far as performances, with the cast capturing more of the fantastical in their voices and the English actors seeming more straightforward. Although it’s not demarcated on the disc menu, switching between the Mandarin and English tracks also results in a switch between English and English SDH (on the English) subtitle tracks. The special features are a mixed bag on this release. The Making Of is brief, but interesting. The short film is odd, and the two music videos are, again, unnecessary additions, but welcome nonetheless. The Digital Copy uses the uncommon VHX service, so no Movies Anywhere, meaning no iTunes, Vudu, Amazon Prime Video, Fandango Now, or Google Play – basically you can only play it back or download it via VHX. Big Fish & Begonia is a gorgeous and heartfelt fantasy that bodes well for the future of animation out of China. This disc looks and sounds great and the film is an instant classic. 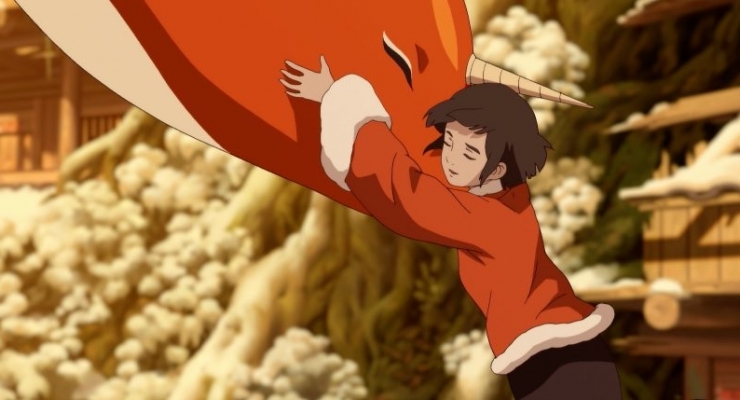 When she travels to the human world in the form of a red dolphin, 16-yar-old Chun is rescued by a boy who drowns in the process. After returning to her ancient world below the sea where the beings there control the seasons and the tides, Chun determines to bring the boy back to life and sets off an epic adventure against her elders and family, with her life now entwined with the boy she is trying to save in this is a beautifully animated, heartfelt adventure out of China that was 12-years in the making.